Information about events and promotions is posted below. Please visit our social media outlets for accurate details and most updated event information. 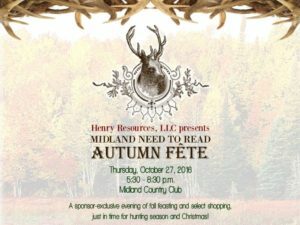 A Sponsor-exclusive evening of fall feasting and select shopping, just in time for hunting season and Christmas. 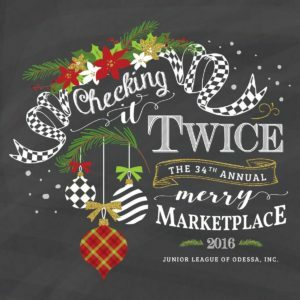 Come join the Junior League of Odessa for a weekend of shopping and giving back! This year we celebrate the 34th Merry Marketplace. We are proud to present our theme "Checking it Twice." Funds raised through Merry Marketplace are returned to the community through support of city-wide projects and Community Assistance Funds. Our mission is to promote volunteerism while developing the potential of women and improving the community through effective action and leadership of trained volunteers. Each year, the Junior League of Odessa contributes thousands of hours and dollars addressing the needs of at-risk families and children in Ector County. 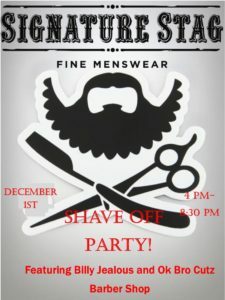 Come join us on December 1st for our SHAVE OFF PARTY! Lose the beard you grew for No Shave November OR come in for a trim or shave on us! Free hot-towel shaves for all those who come in! Complimentary drinks will be served! Our rep from Billy Jeaoulsy, Blake Bennison and the guys from Ok Bro Cutz Barber Shop will be helping us out. Call and book your appointment TODAY! Garth Brooks is coming to town and you should be there! As a thank you for supporting our local business we’re offering a chance to win tickets to one of Garth’s five sold out concerts in Lubbock on March 30 - April 2. Garth’s 138 million solo albums (and counting) sold represent the most in U.S. History. He has won numerous awards and his current tour is shattering records held by acts such as the Beatles and the Rolling Stones. Don’t miss out on this opportunity to see Garth in all his glory right in your home state of Texas. Enter now for a chance to win a pair of tickets. The attorneys at Hamilton, Hull & Byrd are pleased to partner with and support local businesses in Lubbock and Midland. As a thank you for supporting your local businesses we are happy to offer several chances to win a pair of tickets to one of Garth’s five sold out concerts in Lubbock on March 30-April 2.